How wonderful it is to have a goal and see people achieve their goal. My girl has always loved the monkey bars and just hanging around. She has seen us doing pull ups – me assisted, Mick unassisted and I know she has been wanting to be able to get up over the bar for ages now. Before Christmas she discovered that she could using a really thick band and loved the feeling that she could. Today she was showing me how she could do it, and I suggested to her that it was time to change band down to a thinner on – the Red band (same one that I use). She told me she couldn’t do it…. 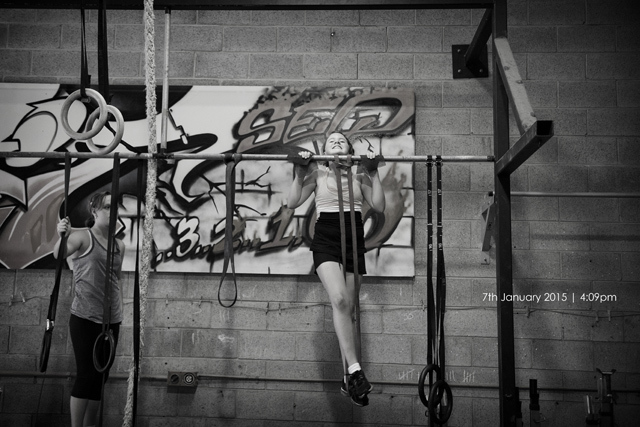 I told her she could – Try, it took some convincing, a few attempts but he got there and the smile on her face for getting her chin up over the bar is priceless. Keep going my princess – if you put your mind to it, believe, strip away the fear – you will see just how much you can fly!